1 “ If ye then be risen with Christ, seek those things which are above, where Christ sitteth on the right hand of God. Have you ever been to a funeral of a loved one and felt so sad, almost to the point of total depression because of the cold, unnatural looking person who you loved lies in a perpetual state of unawareness? Most people have, and I really don't like going to them, as I would rather remember them in life, than have that last image of them in their casket burned into my memory. But you can understand that many people believe that death is the end of our existence, that your loved one is completely gone and never coming back. TheGodless world believes that death is the end of our thoughts, our memories and the end of our consciousness. Think about your loved one for a moment that has passed on. When they were with you, they were warm, animated and engaged with life. Now they are cold and still and totally disconnected from this life. Have you ever reached out and maybe just touched their hand or finger, how it feels like a piece of a stick? All that you knew them to be if gone, and your loss and pain of the unbeliever is overwhelming. One, you have to face your own mortality, as that will be you in the future, should the Lord tarry longer than your date of death, which only He knows. I read where man is the only creature that knows he is going to die. Even though everything on this planet at some point dies, man knows that it also includes him. So why do we fear it so much? Someone who is not a believer in Jesus Christ and has no relationship with God, called an Atheist would argue that the body and the consciousness are one and the same. When the body dies, so does the consciousness of the person. They reduce mankind to some kind of roadkill that was runover in the road and doesn't go to heaven. In this viewpoint, you ARE your body. There is no “ghost in the machine” ..no spirit, nothing that goes on and continues to live. Your brain produces your mind and your mind is what makes you think that you are YOU. An Atheist credits reason for reaching this “enlightened” perspective. But to qualify as an atheist, that person must know EXACTLY what happens to the mind, their will and their emotions. And if they entertain the possibility that death is the great UNKNOWN, then they are not atheist, but now are agnostics...They just don't know for sure. For the worldview that claims “reason” as it's father, it's not very reasonable. WHAT DID THE ANCIENTS BELIEVE ABOUT DEATH? As early as Job's time, God had revealed the existence of the Redeemer Christ, and the PHYSICAL resurrection of the dead. Job not only expected to see Christ with his PHYSICAL eyes, but he expected his physical body to be changed. The prophet Daniel also wrote of what we would be, those who have the Hope of the resurrection to a new life. 2 “And many of them that sleep in the dust of the earth shall awake, some to everlasting life, and some to shame and everlasting contempt. Job awaited the call of a Trumpet that would raise the departed souls from their sleep and raised in a new body. This change was believed a thousand years before it was generally known as the resurrection of the saints, some call the rapture. 12 “So man lieth down, and riseth not: till the heavens be no more, they shall not awake, nor be raised out of their sleep. Many point to the words of Solomon in Ecclesiastes where Solomon referred to the PHYSICAL boy which is “asleep” and not the spirit. Soloman addressed the eventual end of both body AND sprit. But note what Paul the Apostle said concerning the body that dies. It is not the end of all consciousness. Yes, the body dies, but the consciousness lives on. 8 “We are confident, I say, and willing rather to be absent from the body, and to be present with the Lord. May we point to the parable that Jesus gave when He spoke of Lazarus and the rich man? Some say this is just an analogy, but did Jesus lie when He gave parables? No, He spoke them of truth, but many couldn not hear them, or understand them, as it was not meant for them to understand. Because if they remained ignorant of the point, they would not be guilty of sin of unbelief. Jesus spoke truth and never lied when He spoke of such a case that makes the reader heart sick for one so unable to change his destiny. And maybe those who read that identify with that man. It brings a sense of dread to the unbeliever. If you or your loved ones were in such a condiiton, would you not pray for another chance as this rich man did in the story Jesus told? Jesus told us in plain truth what the person experiences upon physical death. Lazarus died physically, but the angels carried him into Abraham's bosom which is another word for Paradise. The rich also died and was totally conscious of his fate while looking up from the flames of hell. 1. Lazarus, Abraham and the rich man were all there, and they were all conscious of their surroundings. 2. the rich man was conscious of his torment and was able to speak with Abraham and was aware of Lazarus whom he knew also. Abraham was also conscious of his surroundings as well and able to give reply to the rich man's questions. note that the rich man was in Hell, not in the Lake of Fire, which establishes the story playing out in real time at some point before the resurrection of Jesus. It was not a scene of the penalty imposed on those at the Great White Throne Judgment. The rich man had memories not only of his life on earth, but the memories of his family as well. The rich man cared for his family, his father and five brothers, so all of his earthly memories remained intact. And also his emotions which are entirely human. His physical body was dead in the grave, or asleep as Solomon puts it, but his soul, what made him who he was, was very much alive in the sense of his consciousness and his mind. So taking this parable and knowing it was an actual event Jesus was telling the people around Him, the question remains, what happens when we die? Answer: We are absent from the body, but there is no cessation of our consciousness until the resurrection of the dead. Our dead bodies will be changed and we will rejoin them and be united and stand before the God of the Universe and give an account of our lives..Some will receive rewards and eternal life at the 1st resurrection, and those raised in the 2nd Resurrection will be raised to judgment and condemnation. 5 “But the rest of the dead lived not again until the thousand years were finished. This is the first resurrection. Note that John speaks of those raised in the 1st Resurrection, but the rest lived not until the end of the 1000 years. He separates the two resurrections. Those who are raised before the Millennium with those Tribulation saints are of the 1st resurrection, beginning with Jesus, the first fruits of those born of the dead. And the second resurrection is not where anyone wants to be, as it will be condemnation, judgment and the penalty of separation from God for all eternity. John addresses the PHYSICAL resurrection of the dead whose consciousness remain awake and very much alive in hell with the rich man until final judgment after the 2nd resurrection of the lost. 11 “And I saw a great white throne, and him that sat on it, from whose face the earth and the heaven fled away; and there was found no place for them. At the coming of Jesus for His church, some believer will not have experienced physical death. They will be instantly changed in to their incorruptible bodies, and those who have experience physical death will be raised prior to those found alive, and they will receive their resurrection bodies first. And then we will all be united in the air, and so shall we ever be with the Lord. THE GREAT DEBATE, WHAT OF THE SPIRIT? 20 “According to my earnest expectation and my hope, that in nothing I shall be ashamed, but that with all boldness, as always, so now also Christ shall be magnified in my body, whether it be by life, or by death. Did you catch that? “I desire to depart and to be with Christ, which is far better” If Paul was desiring to be with Christ, is it in his grave, or his spirit with the glorified Savior whom he saw with his own eyes? The God who blinded him, and was taught by Him in the wilderness for threee years prior to coming to see the other Apostles, and the man who was translated (raptured) into the third heaven and heard words that are not lawful for a man to hear? Paul knew our Savior almost as intimately as the other Apostles, but He knew Him as the glorified Savior in His power and glory. That is who Paul wanted to leave this life and join and he has been with Him, in whatever form of spiritual expression that God has deemed fit, for now over 2000 years. Our loved ones who have gone home to the Lord are ALREADY in His Presence, enjoying Heaven and its unimaginable joy and riches in wha form, we are not told. . They are NOT mouldering in the grave, unconsciously awaiting the call of the Trumpet. Where do you see yourself on this great debate. Are you the rich man waiting for his demise in an eternal hell? Or are you the beggar who is not rich, but rich in the power of the Holy Spirit? 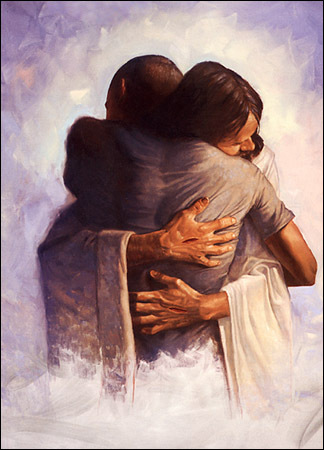 Do you see yourself in the arms of your Savior, or destined to be cast out? It is a question that everyone of us must make a decision over, and it is why everyone that has ever been born has to decide. “what will you do with the God/man, Jesus Christ? Will you accept His free offer of mercy and grace, or will you enjoy your sin and unrighteousness, being deceived but for a short while? This world is coming to an end. Maybe quicker than you even imagine. But the bible says we all die. Are you ready to die? In this life, you only get one chance to get it right. No second chances. No passing GO and collect $200...when you die, you have two places to end up...with Christ, or in hell....or the Lake of Fire. Don't wait, as we are not promised even tomorrow. Tonight might be the beckoning call of death that awaits us all. Look to Jesus, as He will save you only if you ask Him. “For God so loved the Word, that He gave His only begotten Son, that whosover believeth in Him, should not perish, but have everlasting life. Make that decision right now...Your eternal destiny depends on it..